“Sometimes I think that if I had not been adopted and my life had not taken the turn that it took, I probably would not be sitting here as a successful gallery owner,” says Bridgette Mayer. In her early 40s, Mayer is one of the most successful gallery owners in the country. To an outsider, she’s poised, smart and very confident. 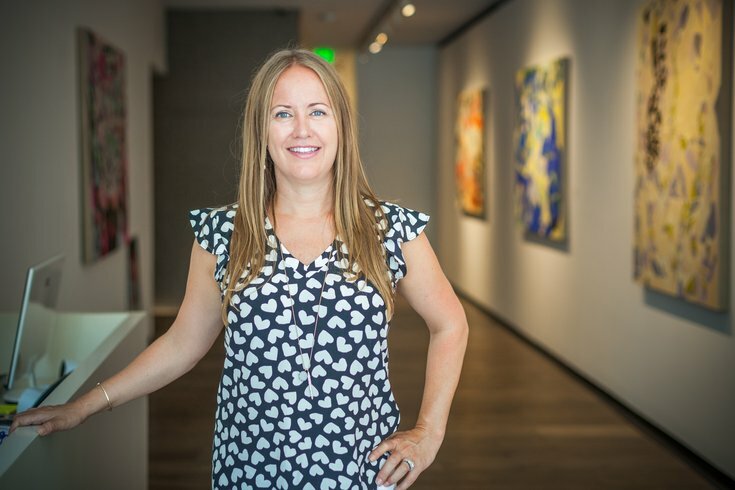 She has it all; her own gallery on Walnut Street and a business that has recently expanded to the West Coast, where she works with some of the wealthiest, most influential collectors in the world. But you won’t find Mayer — who has cultivated a seemingly carefree, sophisticated and earthy look, whether she’s behind the desk at her Washington Square gallery or jet-setting to a tropical destination with her husband, Tariq — apologizing for her success. She hasn’t, like many women who are sometimes expected to soften their approach in the business world, gotten into the habit of downplaying it. She’s proud of her achievements. Life for this art star wasn’t always so beautiful, so full of color. Far from it, in fact. In her new memoir, “The Art Cure: A Memoir of Abuse & Fortune” — to be released later this month — Mayer opens up about her most surprising personal and professional life experiences. It’s part glamor and part darkness overcome. Her story is not only about art and wealth; it’s about her painfully abusive childhood living in poverty in Jersey City and the years she was juggled by a flawed foster care system before finally being adopted. This book is deeply personal. What made you decide to write it, and why now? I’m just starting the journey of releasing this book. I would say a few years ago it was almost at the same time my mom and my husband kept saying to me, “You really need to tell your story. Every time you share it with someone, one on one with an artist, it has such an impact on them and imagine what that could do for more people?” I’m 42 years old and I’ve had a very successful gallery for 16 years and I’ve done fundraising and community stuff and where I feel like I’ve gotten beyond the initial setting up the business and struggling through the first year, and I’m at the point in my life where I’m growing into wanting to contribute to the artist community in a larger way and also contribute to the world in a bigger way. And what I’ve come to realize — and I’ve come to realize this through talking with a lot of dealers and artists and people struggling — that I have a special talent, a gift, for helping artists become successful and for running a successful business. And my life wasn’t always that case. This is your first book. What inspired you to make the leap into writing? My hope is that — for people who need a positive, uplifting message of what is possible for them as a creative person, as an artist, as a business owner, as an art dealer, as a young woman or as a woman in general who might be struggling — that this will light the way of possibility. 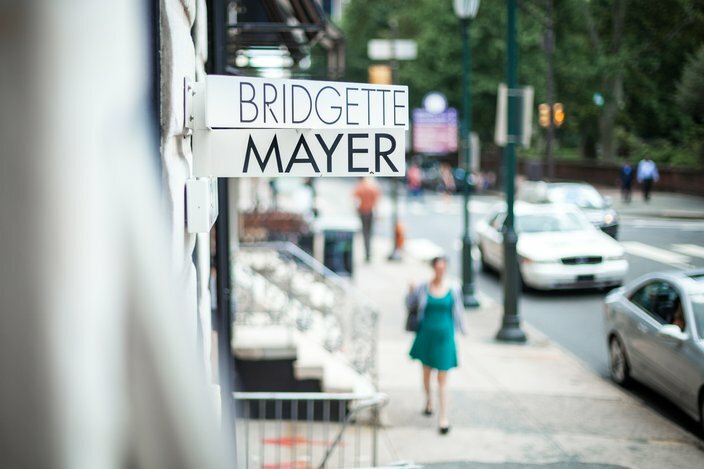 Bridgette Mayer Gallery is located at 709 Walnut St., across from Washington Square..
What was the big turning point for you? You talked about the first glimpse of art as a child. What was that like? In the book, in the introduction, I tell a story that’s a very sad story about something that happened to me with my birth mother. I talk about living in a dirty one-bedroom tenement apartment in Jersey City, New Jersey, and not having any toys or really anything and one day going [in] the bathroom and discovering a bag of makeup that my birth mother had left there, and opening this bag and looking inside and seeing lipstick and eye shadow and an eyeliner pencil. I remember it as this magical moment, this pure delight. I had found this little treasure trove in the bathroom and I remember taking the bag over to a wall and wanted to do something with it, and basically creating a makeup mural and burning through the entire bag of makeup. … I was feeling really compelled to do this, in the back of my mind I knew I was going to get in trouble but I couldn’t help myself. … There was this feeling of lightness, that I had done something that was my own, and no one could take that moment away from me. Did you keep in touch with your biological mother? No. I was terrified of her. … She passed away five years ago. … Once I was adopted I made the full break. But that moment of making that make-up mural is a moment that no one can take away from me and I think that became an inner anchor for me because of the way it felt making something that was my own. Did you have any hesitations about sharing such personal stories about your life? What were some of the ways you prepared yourself to write this memoir? Was the book mostly for your own personal development at that point? Or in the back of your mind did you know this would become something? Maybe in the back of my mind, yes. I didn’t tell anyone. My husband knew and I told my mom, but I kept it pretty casual and nondescript. I spent about 20 hours with [the editor] talking and outlining what a book would be. I wrote an outline of the story, the stories I would want to put into a book and that was it. I put it down and then life got busy and I got married and expanded my business to California, and I was really preoccupied with that. But it was in the back of my mind, kind of nagging me. And I realized this is not how I live my life. I don’t live my life — even if I feel fear — I don’t live my life in fear. And I am not doing this because I’m afraid of the larger public. And I thought, “Well, it’s beyond that. It’s about helping people and also kind of coming through this part of my life and feeling like I want to share it to inspire people.” That took over me. And I started the project again and gave myself a deadline, and just kind of recognized that I wanted to step into the fear and not let it stop me from doing something that I knew I really wanted to do. What about the public’s reaction? Are you nervous about being so candid? As far as the public, part of me says, “Well, I work with so many influential clients and CEO types and very wealthy, high-end art collectors and everyone in between and they’re all going to know this part of my life if they actually pick the book up and am I comfortable with that?” And then I thought, “Well, people who know me well and connect with me well know how much I want to be human in what I’m doing in the art world, so I think that’s why.” If someone is offended by my personal life story then they’re not meant to be. 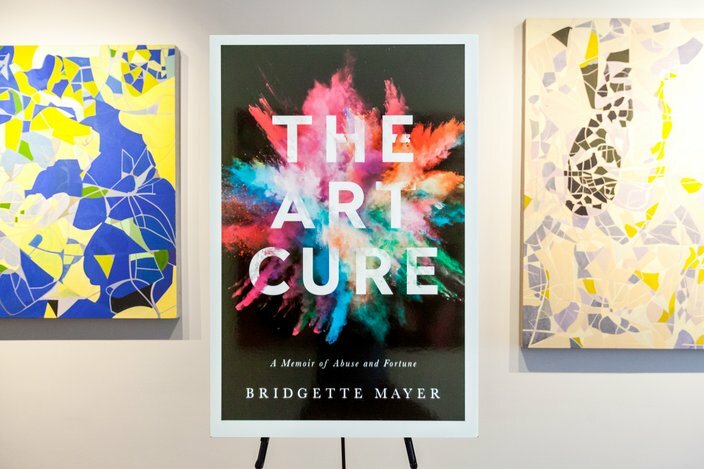 A poster for Mayer's upcoming book, 'The Art Cure'. Is there a certain freedom to having your story coming out? Well, not yet. The freedom’s not there for me yet because I finished the manuscript and I literally did [the] first round of edits with an editor and we’re going to print in two weeks. I read the full book, cover to cover. It’ll be out early-to-mid July. But I can share with you, I read my first edited draft cover to cover and I cried a few times and I was equally elated, and then a little voice popped up in my head, saying, “Who do you think you are writing a book? And who’s going to read this book?” And I was, like, “Who said that? Where is that coming from?” And then I just had to laugh and say, “You know what, don’t listen to that voice.” It made me laugh because I work with artists and I work with people on so many different types of projects and I know the one thing that comes up with artists when I’m usually coaching them is fear. It’s easy to talk yourself out of something and much harder to talk yourself into it, yes? I so relate to that, having coached so many artists over this fear barrier and stepping into it and through it. … I really feel like I broke the pattern [of abuse] and created this incredible life. I’ve separated that part of my past and it makes me sad to see people continuing the cycle. All of our experiences tend to make us who we are, for better or worse, but do you think your most challenging experiences have actually helped you become successful? When I was adopted, for me it was like, “Yeah, now I have this new opportunity for a new life.” But it didn’t mean that it wasn’t challenging. I had to learn to read. I started at seven and spent a whole summer being tutored from early morning to the evening so I could catch up. … But it’s funny — I probably picked one of the most challenging industries to go into. And I realized at some point, “Oh, wow, I’m attracted to challenge that has me preserve and get through something.” Many years of doing that in the art world I finally got to the other side of that with my business. How did you first get into the art world? And I said, “Yes.” So I started working at the gallery at Bucknell at the end of my freshman year. That was my first college job. I also got a part-time job doing graphic design work and displays for the theater department at Bucknell, and I loved both of those jobs. I was around really wonderful, caring people who were taking students under their wings and helping them with doing their jobs and getting them exposed to different aspects of each area. I was designing theater posters and painting displays for the theater department and was creating window displays. I learned how to do publicity there and that was a tremendous opportunity for me to learn something and I loved it. The gallery was about … seeing a show come together from the original concept to the artwork to the hanging of it to publicizing it to the Bucknell community and to the public, and then having openings and having tours. … That set me up with a great foundation and every summer while at Bucknell, most people go to the beach or wherever, I went to New York City and did these fantastic summer internships. …That set me up to have a great résumé by the time I graduated. What brought you to Philadelphia? I had been in New York and decided to move overseas to Asia for a little bit and then I moved back to the United States and worked at an architectural firm in San Francisco doing project management. I decided after being away from my family for so many years that I needed to be back on the East Coast. I was feeling a little bit disconnected from my family. I didn’t want to be back in New York, and I thought Philadelphia was a great city. And you started the Bridgette Mayer Gallery when you were just 26? Yes, in 2001. It started out of frustration on two levels. One working in galleries and creative places and not being paid what I thought my value was worth in the marketplace. And secondly, I read a book by Michael Gerber called the “E-Myth.” It talks about various sectors of being a worker or an employee versus being a business owner and an entrepreneur and that book changed my whole perspective on what I needed to do to create a successful life in the art world. I realized I needed to open my own business. For those who may not be in the art world, why might they be interested in picking up this book? What might resonate? In our culture, people like hearing about a hero’s journey through something difficult into a better life, and then ultimately how that life is going to transform and give back to the world and people that might need help. For me, this is that story. It’s my journey through this difficult life to this great life, and paying that forward into my future with artists and young women and people who may be inspired by the story.